For 19th century French Royalists, see Ultra-royalists. Ultras are a type of football fans renowned for fanatical support. The term originated in Italy but is used worldwide to describe predominantly organized fans of association football teams. 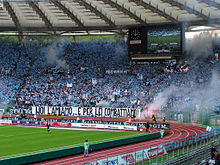 The behavioural tendency of ultras groups includes the use of flares (primarily in tifo choreography), vocal support in large groups and the displaying of banners at football stadiums, all of which are designed to create an atmosphere which encourages their own team and intimidates opposing players and supporters. The use of elaborate displays in stadiums often is common, as well. The actions of ultras groups are occasionally extreme and may be influenced by political ideologies such as conservatism or socialism, or views on racism, ranging from avowed nationalists to anti-fascist. In some instances, this goes to the point where the passionate and loyal support of one's team becomes secondary to the theoretical ideology of the ultras phenomenon. In recent decades, the culture has become a focal point for the movement against the commercialisation of sports and football in particular. The origin of the ultras movement is disputed, with many supporters groups from various countries making claims solely on the basis of their dates of foundation. The level of dispute and confusion is aided by a contemporary tendency (mainly in Europe) to categorize all groups of overtly fanatical supporters as ultras. Supporters groups of a nature comparable to the ultras have been present in Brazil since 1939, when the first torcida organizada was formed. Inspired by the torcidas and the colourful scenes of the 1950 World Cup, supporters of Hajduk Split formed Torcida Split on 28 October 1950. The group is often cited as the oldest torcida style group in Europe. One country closely associated with the ultras movement is Italy. The first Italian ultras groups were formed in 1951, including the Fedelissimi Granata of Torino. The 1960s saw the continuing spread and development of the culture with the formation of the Fossa dei Leoni and Boys San groups, the former often regarded in Italy as the first full-fledged ultras group. The term Ultras was used as a name for the first time in 1969 when supporters of Sampdoria formed the Ultras Tito Cucchiaroni and fans of Torino formed the Ultras Granata. The style of support that would become synonymous with Italian football developed most during the 1970s as more groups formed including the radical S.S. Lazio Ultras in 1974 with a strong predominance of fascist slogans and chants amongst other groups such as Hellas Verona supporters. The active support of the ultras became more apparent, in contrast with the "traditional" culture, choreographic displays, signature banners and symbols, giant flags, drums and fireworks became the norm as groups aimed to take their support to higher levels. The decade also saw the violence and unrest of Italian society at the time overlap with the ultras movement, adding a dimension that has plagued it ever since. The ultras movement spread across Europe during the 1980s, 1990s and 2000s, starting with the countries geographically closest to Italy. Green Brigade are an ultras group that follow Celtic F.C. and regularly make tifo displays and often voice support for a United Ireland and Free Palestine. On the other side of Glasgow are the Rangers F.C ultra group The Union Bears who voice their support for the Protestant religion. In England there are ultras groups at Crystal Palace F.C. (Holmesdale Fanatics) Leicester City F.C (Union FS) and Huddersfield Town F.C. Several Non-League football teams in England have ultras groups that are left-wing, anti-fascist, anti-racist and anti-sexist such as the fans of Dulwich Hamlet F.C. that have a group called the ComFast Chapter who are openly communist. A Vice article claims the far-right Casuals United is at war with anti-fascist football ultras and have come into conflict with the Clapton Ultras and had already caused the disbandment of the anti-EDL Inter Village Firm that followed Mangotsfield United. The clubs in Egypt became a major political force during the uprising against Mubarak in 2011, but were known for long-standing animosity with the police. When 38 members of the Ultras Devils were arrested in Shebeen al-Kom for "belonging to an illegal group" plus additional violent offences, it was seen as a crackdown on the organizations by authorities. Ultras in Turkey have also played a role in the 2013 protests in Turkey, with fans of arch-rivals Galatasaray, Fenerbahçe and Besiktas shielding protesters and allying against police violence. Police responded with raids in the Besiktas neighbourhood, the main breeding ground of ultras of the Beşiktaş club, the Carsi Group. In 2013, the Associated Press stated that the Egyptian Ultras network was one of the most organized movements in Egypt after the Muslim Brotherhood. The ultras scene was introduced to Lebanon in February 2018, with Nejmeh's "Ultras Supernova". Their rivals Ansar quickly followed with their own ultras group, "I Tifosi", one month later. Ahed formed their own ultras group, called "Ultras Yellow Inferno", the same year. Prior to the Arab Club Champions Cup game between Nejmeh and Al-Ahly of Egypt, played on 13 August 2018, seven “Ultras Supernova” fans were arrested by the Egyptian national security because of the negative connotations the word “Ultras” has in Egypt. The fans have been returned to Lebanon by request of the Lebanese Ambassador to Cairo. Ultras groups are usually centred on a core group of founders or leaders (who tend to hold executive control), with smaller subgroups organized by location, friendship or political stance. Ultras tend to use various styles and sizes of banners and flags bearing the name and symbols of their group. Some ultras groups sell their own merchandise to raise funds for performing displays. An ultras group can number from a handful of fans to hundreds or thousands, with larger groups often claiming entire sections of a stadium for themselves. Ultras groups often have a representative who liaises with the club owners on a regular basis, mostly regarding tickets, seat allocations and storage facilities. Some clubs provide groups with cheaper tickets, storage rooms for flags and banners and early access to the stadium before matches in order to prepare displays. These types of favoured relationships are often criticized when ultras groups abuse their power. While ultras groups can become violent, the majority of matches attended by ultras conclude with no violent incidents. Unlike hooligan firms, whose main aim is to fight hooligans of other clubs, the main focus of ultras is generally to support their own team. Some hooligans try to be inconspicuous when they travel; usually not wearing team colours, in order to avoid detection by the police. Within the ultra or hooligan culture however, those dressing to "blend in" would be referred to as casuals, which is viewed by some as a branch of hooliganism, yet still maintaining its own independence and culture. Ultras tend to be more conspicuous when they travel, proudly displaying their scarves and club colours while arriving en masse, which allows the police to keep a close eye on their movements. ^ a b "The dark heart of Italian soccer". CBC Sports. 15 April 2005. Archived from the original on 24 February 2011. Retrieved 18 January 2011. ^ "Fan tragedy sends the fight against Ultras back to square one". The Guardian. 12 November 2007. Archived from the original on 4 December 2013. Retrieved 18 January 2011. ^ "Are German fans really turning against the beautiful game?". The Guardian. 7 April 2008. Archived from the original on 4 December 2013. Retrieved 18 January 2011. ^ a b "We Don't Fight, We Paint Flags Instead". In Bed With Maradona. 2 November 2010. Archived from the original on 13 July 2011. Retrieved 5 February 2011. ^ "Povijest". Torcida.hr (in Croatian). Archived from the original on 17 February 2011. Retrieved 5 February 2011. ^ "Ultra sensitive". When Saturday Comes. April 2007. Archived from the original on 24 January 2011. Retrieved 18 January 2011. ^ "Ultras rule?". Football Italia. 28 October 2009. Archived from the original on 23 November 2010. Retrieved 18 January 2011. ^ Alberto Testa, Gary Armstrong (2010). Football, Fascism and Fandom. A&C Black. ISBN 978-1-4081-2371-3. ^ "Passion, politics and violence: A socio-historical analysis of Spanish ultras". Informaworld. March 2005. Retrieved 18 January 2011. ^ "The Green Brigade: Celtic fan group's timeline of colour and controversy". The Scottish Sun. 22 July 2017. Archived from the original on 11 April 2018. Retrieved 10 April 2018. ^ Bakowski, Gregg (23 October 2016). "Ultra culture could help Premier League terraces take positive steps". The Guardian. Archived from the original on 11 April 2018. Retrieved 10 April 2018. ^ "Palace 'ultras' causing anxiety". ESPN. Archived from the original on 11 April 2018. Retrieved 10 April 2018. ^ Barker, Matthew. "When Saturday Comes - Crystal Palace ultras under pressure from club and fans". When Saturday Comes. Archived from the original on 11 April 2018. Retrieved 10 April 2018. ^ "Eastbourne Town's 'ultras' are game for a laugh and making football welcome to all". iNews. 16 November 2017. Archived from the original on 11 April 2018. Retrieved 10 April 2018. ^ "London's Left-Wing Utopian Non-League Ultras Are Reclaiming Football". Vice. 5 January 2015. Archived from the original on 11 April 2018. Retrieved 10 April 2018. ^ "The English Far-Right's War on Anti-Fascist Football Ultras". Vice. 13 February 2015. Archived from the original on 11 April 2018. Retrieved 10 April 2018. ^ "The FA – Kicking anti-racism out of football". Supporters Not Customers. 16 January 2014. Archived from the original on 11 April 2018. Retrieved 10 April 2018. ^ a b c el Deeb, Sarah (14 March 2013). "Egypt: 38 soccer fans charged with violence". USA Today. Associated Press. Archived from the original on 10 October 2017. Retrieved 10 October 2017. ^ a b c d "Ultras pull the strings as Italy descends into chaos". The Guardian. 4 February 2007. Archived from the original on 2 October 2014. Retrieved 5 February 2011. ^ "Gruppi". asromaultras.org (in Italian). Archived from the original on 12 February 2011. Retrieved 5 February 2011. ^ "AS Roma Ultras". asromaultras.org (in Italian). Archived from the original on 13 February 2011. Retrieved 18 January 2011. ^ "Ultra vires". Spiked. 9 February 2007. Archived from the original on 24 February 2011. Retrieved 18 January 2011. Wikimedia Commons has media related to Ultras. Dyal, Mark. (2018) Hated & Proud: Ultras Contra Modernity, London, Arktos. Prof. Dr. Gunter A. Pilz: "International Conference on Ultras. Overview of the Ultra culture phenomenon in the Council of Europe member states in 2009" (PDF). (195 KB) Leibniz University Hanover, 18 January 2010. Testa, A. and Armstrong, G. (in press; November 2010). Football, Fascism and Fandom: The UltraS of Italian Football, A&C (Bloomsbury), London, Black Publishers. "Violence Threats to Italian Iconic Landmarks and Stadiums". TAL Global Corporation.